This Recon 1 model has a black finished tanto blade made from S35VN steel and a black G-10 handle. 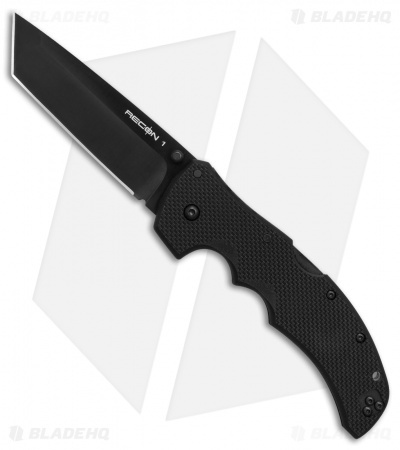 Cold Steel has made a name for themselves by creating high performance knives like their Recon 1 tactical folding knives. This model adds to the already over-engineered Recon folder by outfitting it with a SPM-S35VN steel blade that offers superior edge sharpness, retention, and toughness. In addition, the blade has a durable black DLC finish. The Recon 1 utilizes Cold Steel's Tri-Ad Lock and strong, lightweight G-10 handles for unbelievable strength. Ambidextrous lock design, thumb stud openers, and a reversible pocket clip. I bought this knife a while ago, and I’ve only used it twice. And after that small amount of use I have 3 chips on the edge. Solid knife. Mine might be a special exception. I've been skeptical about cold steel products in the past. I never really got the appeal, but getting this thing in hand, I was blown away with the quality and solidity of the knife. Value seems to be there as well, s35vn for under a hundred dollars. Check it out if you're remotely interested. It won't disappoint. It came razer sharp out of the box, and for the price its hard to beat.Its a very big yet a very pretty knife. Almost perfect Edc.I think even if you like a small knife, you would still like this knife. 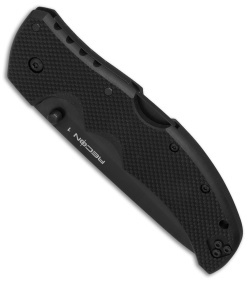 Only flaw: The pocket clip is very "small" compared to the knife and gets stuck if you pocket sometimes. So far its quite nice. Good steel, beyond razor sharp and really good price. For all the nit pickers this is a cold steel knife not a fit and finish gem or pocket jewlery, this is a tool with purpose and it serves its purpose extremely well. I will update review with harduse after christmass. This is honestly one of the better EDC knives I've ever carried for consistent hard use. I do heavy concrete work on bridges and my knives get used to death.....sharpened and used to death again! 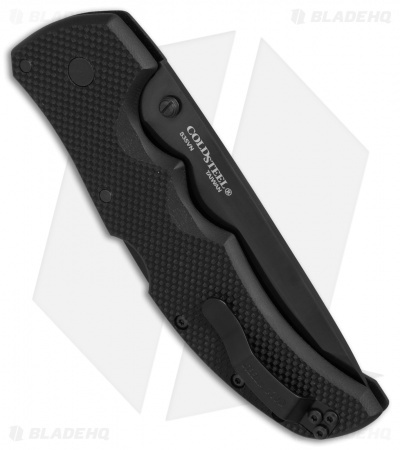 This knife is as strong as any Ernst, ZT or other custom knife brands. This is my first Recon in S35VN. My other 3 were Aus8 steel.